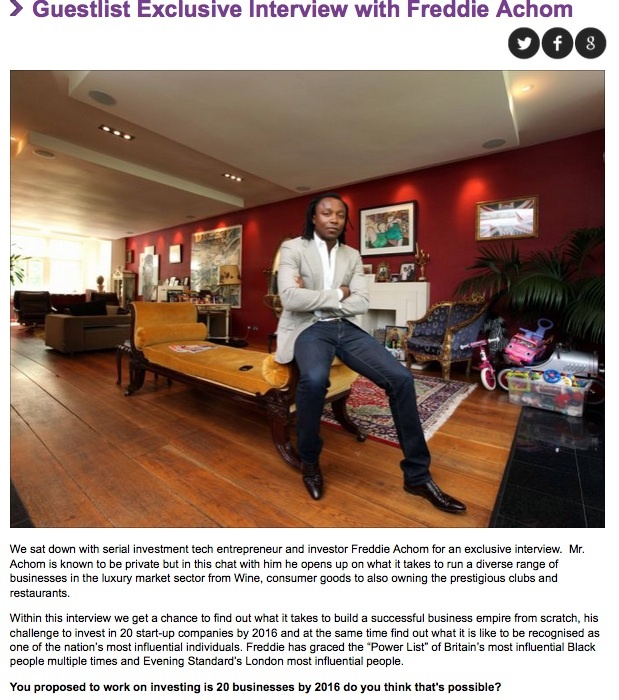 We sat down with serial investment tech entrepreneur and investor Freddie Achom for an exclusive interview. Mr. Achom is known to be private but in this chat with him he opens up on what it takes to run a diverse range of businesses in the luxury market sector from Wine, consumer goods to also owning the prestigious clubs and restaurants. Within this interview we get a chance to find out what it takes to build a successful business empire from scratch, his challenge to invest in 20 start-up companies by 2016 and at the same time find out what it is like to be recognised as one of the nation’s most influential individuals. Freddie has graced the “Power List” of Britain’s most influential Black people multiple times and Evening Standard’s London most influential people. You proposed to work on investing is 20 businesses by 2016 do you think that’s possible? Yes I do, I believe its possible being that now the entry barrier to starting a business has gone now due to technology, that’s why more entrepreneurs are emerging. Currently we have invested in a wide range of businesses from tech, media platforms to solar power projects. When starting or investing in a business, what are the key factors you look for? It depends on the type of business sector, each sector is different, but generally the key factors I look for are good leadership skills, a vision for the company and clear sight to revenue / value creation. What would you say to a budding entrepreneur with a good idea but without the connections or network? To be honest there are no excuses anymore, the Internet has made possible for anyone to research potential investors and to participate networking events. Would you recommend aspiring entrepreneur to ditch the employment route and jump straight into business? No not necessarily, because the mistakes you make as a budding entrepreneur can be avoided by learning through employment, that’s how I got my start, I worked for a commission sales based company before I started in business. Also there’s nothing wrong with working on your business part time. Do you think the United Kingdom has made it easier for young people to go into business? The assistance you get in the UK is great for the fact that you have the ability to have access to resources through government agencies and government initiatives. Would you say the Internet has made becoming an entrepreneur easier or harder because of the competition? It has made it easier for entrepreneurs and those with great ideas to come together and to achieve their goals and their success. The great thing about having access to the Internet is that you can start a tech company from your bedroom with little resources. What advise would you give to budding entrepreneurs that are afraid to go out of their comfort zone? I always say go into places you shouldn’t be in, that’s what I love most, I love being in a room that I shouldn’t be in. How important is networking in becoming successful? I would say networking is 60 to 70% of most businesses but of it also depends on what sector your in. Access to a good network can assist a business to expand or gain traction more rapidly. How does it feel to make the 2015 Power List Britain’s most black influential people? It’s always humbling to be recognised for my work in business even though I believe I still have far to go. The most important thing I’m proud of is how they acknowledged my giving back to society, even though I plan to give back more in the future it’s always good to help effect change. How can anyone send a business idea?